Southern Spot Charters Captain Wes Chesnutt joins the North End Charter Fleet. His specialty is inshore fishing, targeting large schools of fish in shallow water. Captain John Brackett joins the North End Charter Fleet with his boat the Sweet Pea. The Sweet Pea is a 22 ft. Glacier Bay Twin Engine Cat boat fully equipped with the latest electronics and tackle. Captain Johnny Wallker and Captain Eric Moore have won the Woody's Kingfish Tournament on June 11. This make two years in a row for "Team Persistence" amd three in a row for the North End Charter Fleet. The Serg Restaurant Group chooses the North End Charter Fleet as its best pick on Hiton Head Island for Charter Fishing. The fleet will be highlighted in its upcoming promotion. 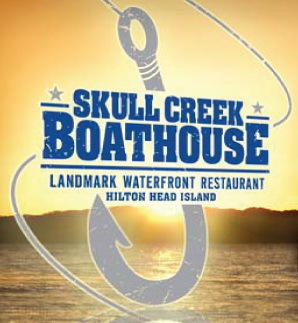 The Serg Group includes premier restaurants including the Skull Creek Boathouse, Frankie Bones, Wise Guys, and other fine restaurants on Hilton Head Island. You can’t go wrong with the Serg Group – or for that matter – the North End Charter Fleet. The Catmandoo joins the North End Charter Fleet. Captain Jim Scott Middleton is an experienced charter captain and a great addition to the fleet. Also Captain Michael Perry will join us shortly, another experienced Captain with great background in the waters around Hilton Head Island. Congrats to Captains Johnny Walker and Eric Moore and their team aboard The Persistence for winning the Captain Woody's Annual King Mackerel Fishing Tournament! Congratulations to our very own Captain Bill Parker aboard The Runaway for winning both the Largest Fish and the Calcutta for the 25th Annual Food & Beverage Fishing Tournament!!! The Skull Creek Boathouse Resturant opens and features North End Charter Boats and their logos in the restrauant. The North End Charter Fleet Welcomes Cheers to it's docks for a great day of sailing.